This is part two of our case study. Our patient is an 8-year-old Thoroughbred cross gelding used for hunter classes that came to Pilchuck with acute lameness. On the second part of any lameness examination, it is very important to repeat the initial evaluation of movement. The lameness can look very different, from being more evident to the horse being sound. In this case, on a straight line, the horse was still a grade 3/5 lame (i.e., he had a consistent head nod on the left front). Based upon the plan made after the first day of evaluation, we started with intra-articular anesthesia of the left fetlock joint. This resulted in the horse trotting markedly better on a straight line and circle at 10 minutes. At 5 minutes, however, the horse was only slightly better. With this sort of nerve block, we pay close attention to the time since the injection which allows us to interpret which tissue was blocked as the anesthetic agent (carbocaine) will diffuse into the surrounding tissue. If the horse is sound at 5 minutes, we can interpret this as indicting the joint and cartilage; if it takes 10 to 15 minutes for the horse to become sound, we can interpret that part of the lameness may be inside the joint or the soft-tissue structures directly next to the joint. These structures will include the collateral ligaments, which are in all joints and other structures. The cause of pain was localized better to the fetlock joint region directly. With this information, an ultrasound was performed with strict attention paid to this region. The collateral ligaments, the front and back of the fetlock joint, the suspensory branches, the tendon sheath with the deep digital and superficial digital flexor tendons, and the sesamoidean ligaments under the sesamoid bones were all examined. The group of small sesamoidean ligaments (the oblique and straight sesamoideans) can be very difficult to ultrasound, and damage may not be evident on ultrasound even where there is significant injury. In this case, ultrasound of this area revealed an increase in joint fluid with no abnormalities in the surrounding soft-tissue structures. At this point, the lameness had been specifically localized, but we did not have a definitive diagnosis. Options included further diagnostics with an MRI, rest the horse for at least two months, then re-evaluate, or inject the fetlock joint with anti-inflammatories and assess response. For this patient, it was elected to inject the fetlock joint with anti-inflammatories and evaluate the lameness again in one week. Evaluation after one week revealed that the horse was sound on a straight line. Therefore, the horse was allowed to be ridden at a walk (15 minutes) and trot (5 minutes and increasing by 5 minutes each week). The horse was sound for the first week and then was back to being lame. Based upon all this information, our list of possible causes included a cartilage and bone injury in the joint, or collateral ligaments of the joint that cannot be picked up on ultrasound. Options now were rest, an MRI, or diagnostic arthroscopic surgery to assess the joint. It was just as likely that the horse’s injury was in the joint as in the soft tissue, and an MRI would give the most information. The advantage of an MRI is a definitive diagnosis; the disadvantage is the need for general anesthesia and expense. An MRI was elected, and the results revealed a very focal cartilage and bone injury on the joint. Now that a definitive diagnosis was obtained, a treatment program could be developed. Arthroscopic surgery was recommended and performed and the damaged area of cartilage was removed, which allowed for healing of the bone and joint. Following a four-month rest period, the horse was evaluated for soundness. He was sound and able to be returned to exercise. At a one-year follow-up, the horse had returned to showing. This case is a good illustration of a lameness that needed a systematic and complete workup to actually arrive at the definitive cause. In some cases, the diagnosis may be reached easily or require only a few steps. 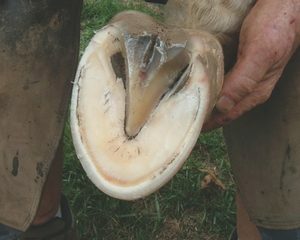 In all cases, it is important to approach the lameness in a stepwise manner.